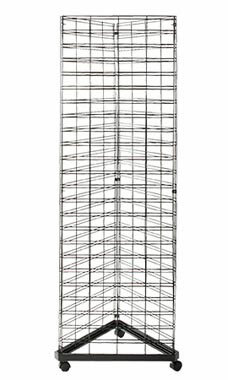 Display your various products in style with this Triangle Slat Grid Tower! The Triangle Slat Grid Unit includes: (3)2' x 6' Slat Grid Panels; (9)Wire Grid Connectors and (1)Triangle Grid Base with Casters. Sold in a stylish black finish, this tower unit will look great anywhere in your store! Measuring 24'' x 24'' x 24'' x 6-1/2’ tall, this unit has plenty of extra room that will add to your showroom’s space. At the cheapest price that you can find, and backed by our 110% Low Price Guarantee, this piece is a great addition to any showroom. In stock and available for shipping the same day we receive your order. Some many items can be displayed in one small area. I would recommend these to anyone. LOVE THESE, THEY HOLD LOTS OF STUFF AND LOVE THE FACT IT IS ON WHEELS. GREAT PRICE. We needed some additional hanging area and this takes up a minimal amount of room in our small shop. This product is very sturdy and as good as the identical tower that we paid twice as much for from another vendor. This is an awesome rack. Works great for our display needs. I would definitely recommend.